Perplexed by PowerPoint? Looking to excel at Excel? From Access to Word—and every application in between—this all-encompassing guide provides plain-English guidance on mastering the entire Microsoft Office suite. Through easy-to-follow instruction, you'll quickly get up and running with Excel, Word, PowerPoint, Outlook, Access, Publisher, Charts and Graphics, OneNote, and more—and make your work and home life easier, more productive, and more streamlined. Microsoft Office is the leading productivity tool in the world. From word processing to business communication to data crunching, it requires a lot of knowledge to operate it—let alone master it. Luckily, Office 2016 All-in-One For Dummies is here to deliver the breadth of information you need to complete basic tasks and drill down into Office's advanced features. 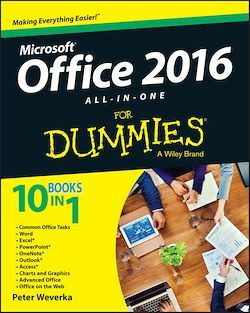 Clocking in at over 800 pages, Office 2016 All-in-One For Dummies will be the singular Microsoft Office resource you'll turn to again and again.